While my siblings weren’t with us at this time, they told of their living at several army bases, one in Louisiana (where the roaches were monstrous) and another in Florida when I apparently was not there. My brother spoke to me just last year how he and my (now deceased) older brother as boys worked at a base bowling alley hand setting bowling pins for the soldiers. They’d each take home a dime or two in tips on the nights they worked. I remember snatches of my life from around three or four, after we were all back together living near my father’s family home, but find it very difficult to make all these very early pieces of the puzzle of my early life fit together. I’m surmising had it not been for WWII I might never have been born! From what I’ve been told all my life, when this picture was taken I was between 2- and 3-years-old and we lived in a house or apartment complex owned by an an old couple who lived downstairs. My mother worked for the U.S. Postal Service and while she was at work I was left in their charge.The woman was German and still spoke with a thick German accent, and her Italian husband also spoke with a heavy accent. While these pictures have been around for as long as I remember, I’m surprised to see now how young the “old couple” probably were–in their fifties perhaps? That’s Mrs. Vano with her daughter Marjorie (or Margie). While Vano is the surname I remember, it may not be entirely accurate–a shortened version perhaps? Look at that cigarette in her hand. An indication of living a real life outside my memories. Somehow I never did think of them all these years as real people but only as paper doll cutouts from these early scenes of my life. Now I wonder about them. Are there members of the Vano tribe, perhaps their grandchildren–Marjorie’s children–still living there? One story as I was growing up was that my pious southern Baptist parents (okay, my mother was!) took me along with them to a party downstairs at the Vanos one evening. My mother was served a drink and on the first sip realized it had alcohol in it so she slipped it discreetly onto the floor under her chair. Sometime during the evening, I apparently squirmed out of her lap, found it and proceeded to drink every drop. When the Vanos learned what I’d done, they weren’t surprised at all. One or both of them roared with laughter and noted that oh yes, that child can really put away the beer for such a little thing. I’m certain my mother was in a quandary about the suitability of those “alcohol consumers” as babysitters. But as I loved them as much as they adored me, so she chose to ignore it. Here I am, already destined to be a little fashion setter at such a tender age, dressed in my wool turquoise coat and hat and sensible shoes. What’s missing are the matching pants that I distinctly remember all these years later. They had funny fan looking things at thigh level, and I always wished they weren’t there but who was I to complain? Years later I would learn that they were called jodphurs. They’re still around apparently, but mainly used now as equestrian gear that look nothing like the pants matching this coat, which research reveals were the German style as favored by women aviators of the period. I’ll be visiting the east coast soon, including New York. While I’m there, and especially if I spend much time in Long Island, where my daughter now teaches in a private university, I’m sure I’ll be peering into faces of people I might pass on the street a little more closely than usual and wonder if any of them know or knew Margie, who would have to be in her nineties now if she were alive–but I’m pretty sure all the principal players in this drama have all passed on now. Too bad I never thought to find connections while it might have still been possible. 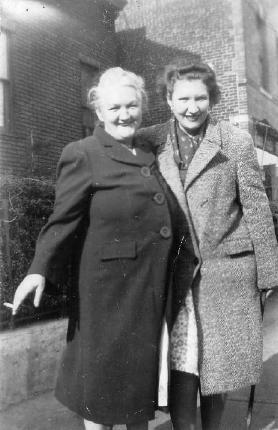 While talking with a parishioner (age – 80+) this month, turns out she was a close friend of my late aunt (in Massachusetts), from their 20’s until my aunt’s death. 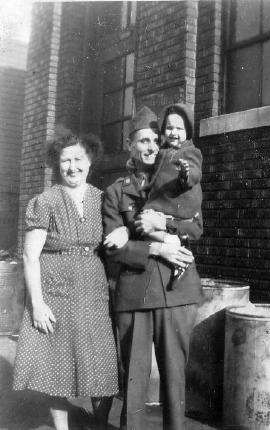 I could almost match you, photo for photo, but my father was never in the military. They were probably eight or ten years older than your parents. Get your brothers and sisters to write down as many of their memories as they remember. That will help. Thanks so much for all the notes. Sometimes I don’t think anyone reads this blog Postcards, and I certainly do appreciate your notes. Have a cool day, we are creeping into the heat here again, into misery indeed. I always read- but sometimes life is just too chaotic to comment! Trial note……and it leaves pictures. 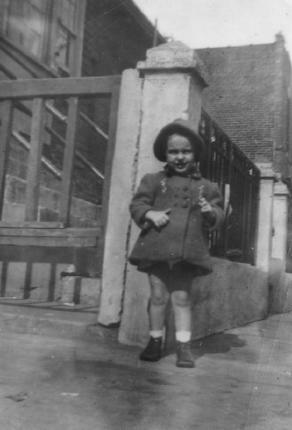 I had a coat, hat and trouser suit when I was little. The trousers were straight legged. These stories of our young lives not alone evoke memories of the past for us but are a social history for the younger generation. Thanks for triggering memories. I used advance search and typed in Vano and the last state of residence New York. There are a few of them. Perhaps some of them are the people you remember. This is beautiful. I’m so glad you take the time to write down your recollections and the family stories. Including the photographs makes this post priceless.